Our calendar magnets can be printed using any year and any information you would like. We can develop a key to indicate holidays or events of interest on your calendar magnets. Calendar magnets are a great way to get your business name into your customer's homes. Real estate agencies, attorneys, and many other businesses can use calendar magnets to break through the clutter of junk mail to reach customers in their homes. You can use calendar magnets for all of your advertising and marketing needs. You can also use our calendar magnets as a fundraiser for your organization. Calendar magnets can be tailored to fit your needs. From real estate agencies to plumbers, all sorts of businesses can benefit from top-of-mind awareness that calendar magnets can generate. Also, a calendar magnet for a local school schedule can be printed with your information at the top. These calendar magnets can offer positive brand associations by sponsoring the school information. We print all of our calendar magnets with a full bleed at no extra cost, which means you can maximize the space of your magnets. Also, there is no limit to the imprint area of your custom calendar magnets. Calendar magnets are 20 MIL thick. 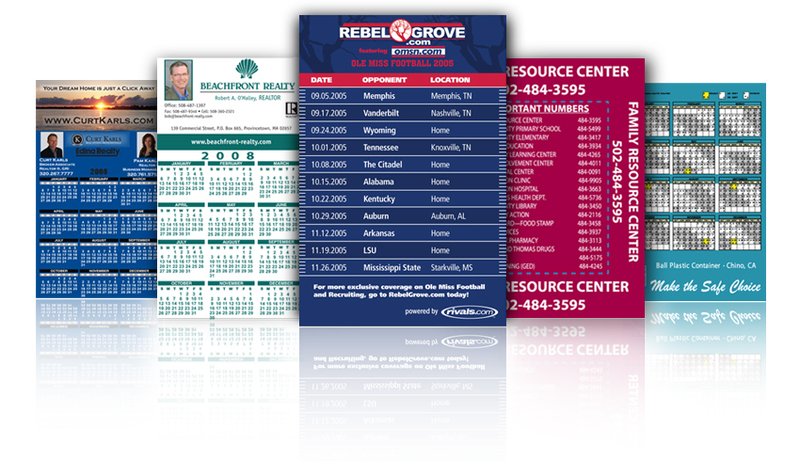 Calendar magnets are digitally offset printed on paper. All of our calendar magnets come laminated with a ultra clear markable mylar covering. The standard sizes for Calendar magnets is 4"x 6", 4" x 7", or 5" X 7".